The 24.9 metre sportfish motor yacht Mistress, listed for sale by Chris Carrere at Galati Yacht Sales, has been sold with Patrick Kelly at HMY Yachts introducing the buyer. 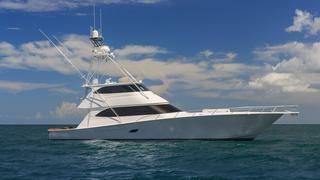 Built in GRP by US yard Viking, Mistress was delivered in 2013 as one of the most highly specified boats from the yard. Accommodation is for 10 guests in five cabins consisting of a full beam master suite with a 46 inch flat screen television, two doubles and two twins, all with access to the yacht’s Kaleidescape server delivering on demand video and audio, and all cabins have en suite bathroom facilities. In addition, there is a large utility room that can be pressed into service as a sixth cabin if needed. A sumptuous saloon is decorated with custom Amtico flooring, LED lighting and high gloss joinery making it the ideal space for hosting large parties. There is also a sophisticated entertainment centre with a 55 inch television screen on a rise and fall mechanism. The cockpit comes complete with a fighting chair, bait boxes, rod holders and all the other necessities for big game fishing. Up on the enclosed flybridge pride of place is taken by a single Stidd helm chair while home comforts include a 33 inch pop up television screen, matching armchairs and a sofa upholstered in buckskin, a teak cocktail table and a custom liquor storage cabinet. Her Palm Beach tower boasts every imaginable electronic device to help in the search for fish. Twin 2,600hp MTU engines give her a top speed of 36 knots and she is fitted with Seakeeper gyroscopic zero speed stabilizers.